This should make it easier for you to print out my weekly deals! If you click on the link to a particular post, you will get a “Printer Friendly Link” to the top left of the post! Click on this and you can print out my deals in a nice printer friendly version with no pictures or links. Hopefully, this is helpful! The main key is you HAVE to click on the “Permalink” of the post. You can’t use “Printer Friendly Version” from my main page. Click on the Printer Friendly Version Link in the upper left hand corner of my blog entry. Much nicer! 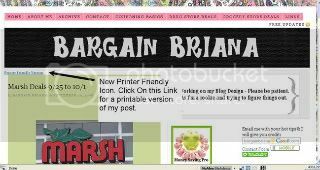 Now you can print out my deals, match up your coupons, and take it to the store with you! Please leave me some feedback on this new feature! Do you like it? Any glitches? $2.00 off Bertolli Oven Bake Meals.